cat eyes & skinny jeans: mark Brings Michelle Vale to the Masses! Back in March I introduced you to mark’s ultra-delectable handbag collaboration with Rebecca Minkoff, which produced the Delight Bag; today, I am showcasing mark’s latest designer handbag collaboration via the Michelle Vale Convertible Bag (Retail Price: $58.00), which is modeled after the celebrity-adored Michelle Vale Entrechat (Retail Price: $895.00). Like Rebecca Minkoff, Michelle Vale has a long-list of celebrity clientele who worship her creations – especially the Entrechat, which has been seen on Kate Beckinsale and Kate Bosworth. As you all know, I am a huge fan of mark’s beauty products; but I have grown to love their accessories, as they are so well-constructed, gorgeous, and (not to be forgotten), affordable! The Michelle Vale Convertible Bag is no different. Though it is constructed out of faux leather; it features the very same qualities as its higher-priced counterpart, making it a completely luxe look for less – and an absolute necessity for your handbag collection! mark knows what the girl-on-the-go desires in an accessory – a multifaceted marvel that can easily convert from casual to chic in a flash; and the Michelle Vale Convertible Bag offers precisely that. This is the bag that will see you through summer flings and girls nights; business meetings and knee-shaking job interviews. Scoop one up while you have the chance! 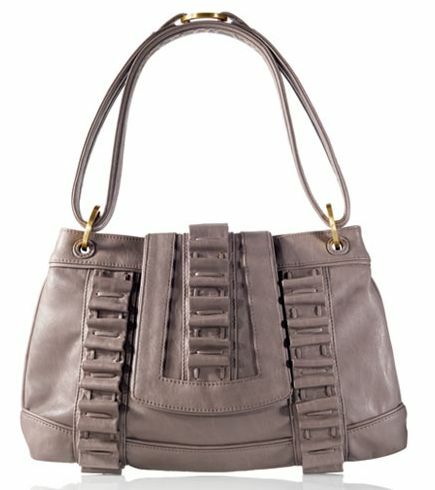 What do you think of the Michelle Vale Convertible Bag for mark? Thanks to mark for the pictures. I definitely love that its affordable! Very unique bag that looks as if it could carry the daily essentials. Loved your review. Awesome handbag! Hmm yeah, I've never liked Rebecca Minkoff, so maybe that's why I'm not exactly lusting after Michelle Vale. The crimped detailing is not doing it for me. Stiff ruffles? I'll pass. It looks like such a cute bag. And I love how versatile it seems. I think I want it!!! Really cute, I LOVE that color scheme on it.